The Tom Clancy universe in video games is no stranger to crossing and tie-in storylines. In Tom Clancy's H.A.W.X., two missions include air support for the Ghosts of Ghost Recon. 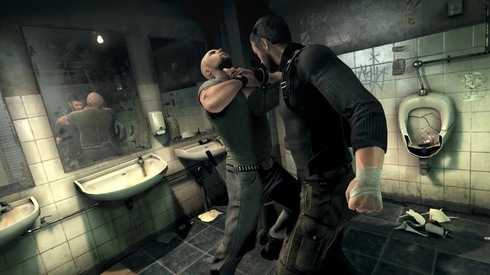 There was once a rumor that Splinter Cell Sam Fisher would appear in a Rainbow Six Vegas game, although to my knowledge that was ultimately cut. And we've once heard Ubisoft mention that a future goal for the Tom Clancy series was to create a persistent world that all of the franchises contributed to, like a multi-title MMO*. So far, Mr. Fisher has not ventured into non-Splinter Cell territory; however, the last two games that feature our favorite triclops-adorned acrobat (Chaos Theory and Double Agent, respectively) each included a two-player co-op side campaign. These co-op modes have been sadly overlooked in the past, but despite this Ubisoft is not only including a similar campaign in Splinter Cell: Conviction...but it will be around six hours long! Like in the previous co-op campaigns, two players can assume the roles of NSA agents. It hasn't yet been revealed if the co-op will be online or splitscreen, but if the progression of past titles are any indication, we expect both options will be available. Ubisoft is obviously excited about these two new characters - code named Archer and Kestrel - and I'll be honest: so am I. “If Sam Fisher is our panther, then these two guys are like a couple of Velociraptors taking down the herd,” states [Co-op Game Designer Patrick Redding]. In another part of the world, news has come out of the Ubi offices that a demo will be released in January, shortly before the February 23rd release of the full game. This is the first we've heard of both, and whether or not the demo includes co-op play...today Ubisoft has our attention like a rogue agent hauling us backward through a fourth-story window.